West Indies 8-172 (Chris Gayle 39, Kieron Pollard 30, Mohammad Irfan 3-32) beat Pakistan 170 (Misbah-ul-Haq 96*, Nasir Jamshed 50, Kemar Roach 3-28, Sunil Narine 3-34)by two wickets. Pakistan was bowled out for 170 runs with 12 balls still remaining in the allotted quota of 50 overs and West Indies achieved the target by smashing 172 runs for the loss of 8 wickets in 40.4 overs. Kemar Roach (West Indies) was declared ‘Player of the match’ for his outstanding lethal bowling in the game. The 2nd match of the 2013, ICC Champions Trophy was played on Friday, June 7, 2013, at Kennington Oval, London. Earlier, Dwayne Bravo, the leader of the Windies, won the toss and invited the Green Shirts to bat first under seaming conditions. The decision paid off instantly as Pakistan lost their three top order batsmen for 15 mere runs in 6.1 overs. The speedster of the Caribbeans, Kemar Roach, removed the three batsmen, Imran Farhat, Mohammad Hafeez and Asad Shafiq for 2, 4 and 0 runs respectively. The skipper of Pakistan, Misbah-ul-Haq and Nasir Jamshed tried to stabilise the innings as the first was dropped at 0 by Denesh Ramdin off Roach in the 9th over. Nasir Jamshed kept on playing his shots as Misbah-ul-Haq kept on defending at his end. The first was dropped at 30 by Ramdin again as Misbah-ul-Haq hit his first four on the 34th ball followed by a six in the 24th over. Nasir Jamshed reached his 4th ODI fifty on the last ball of the 29th over but was caught by Ravi Rampaul off Sunil Narine for 50 off 93 with 5 fours on the first delivery of the next over. Shoaib Malik was removed by Narine in the same over and the bowler got his third wicket when Kamran Akmal was caught behind by Ramdin for just two runs. Misbah-ul-Haq attained his 24th ODI half century in the 32nd over as the wickets kept on crumbling at the other end. There were a couple of run outs and they were struggling at 9-138 in 40.3 overs. Mohammad Irfan gave a nice support to his skipper but was finally gone for two runs on the last ball of the 48th over. Misbah-ul-Haq remained unbeaten for 96 off 127 deliveries with 3 big sixes and 5 fours as Pakistan managed 170 in 48 overs. Kemar Roach and Sunil Narine were the supreme bowlers with three wickets each whereas Ravi Rampaul and Dwayne Bravo claimed one wicket each. West Indies did not have a smooth start either since they lost two quick wickets for just 15 runs. 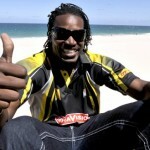 Johnson Charles and Darren Bravo were sent back to the pavilion by Mohammad Irfan for 9 and 0 runs. Marlon Samuels joined in next with Chris Gayle and they gathered 10 runs in the seventh over. Gayle hit two consecutive fours in the 9th over and Samuels added two boundaries in the following overs. The third wicket partnership was broken at 78 in 17 overs when Saeed Ajmal clean bowled Chris Gayle for 39 off 47 with 1 six and 4 fours. Pakistan got back in the game by getting two quick wickets as Marlon Samuels was smartly stumped by Kamran Akmal off Mohammad Hafeez for 30 from 57 deliveries with 1 six and 1 four. The Windies were in some sort of trouble at 5-94 in 25.1 overs as Kieron Pollard and Dwayne Bravo got together. The duo did not take any risk and waited for the loose ball to get the boundaries. The score went past the hundred runs mark in the 28th over as Pollard was dropped at 16 by the wicket keeper Kamran Akmal off Mohammad Hafeez. The score was taken to 137 in 35.3 overs when Kieron Pollard was caught behind off Wahab Riaz for 30 off 58 with 1 six and 3 fours. Bravo went after the addition of six wickets for 19 as Kemar Roach hit the winning four on the fourth ball of the 41st over as the Caribbeans posted 8-172. Mohammad Irfan was the highest wicket taker with three, Saeed Ajmal and Wahab Riaz held two each whereas Mohammad Hafeez got one wicket. West Indies won the interesting battle by a margin of two wickets and secured two important points.